Nothing compares to the rush of emotions that a couple feels during their wedding day, but what most people aren’t aware of is the amount of stress that every bride and groom has to go through to prepare for this special moment. 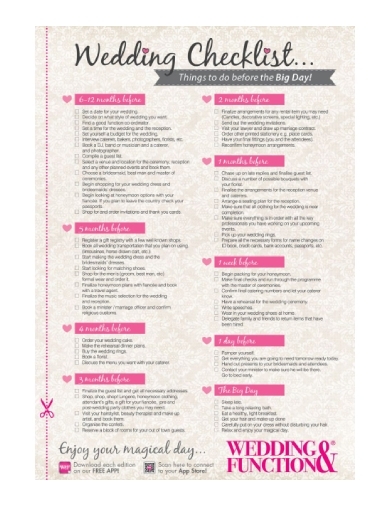 In most cases, checklist templates are involved to make sure that every detail of the wedding has been accounted for. A wedding checklist has proven to keep wedding planners and their clients properly organized to avoid any major mishaps during the big day. 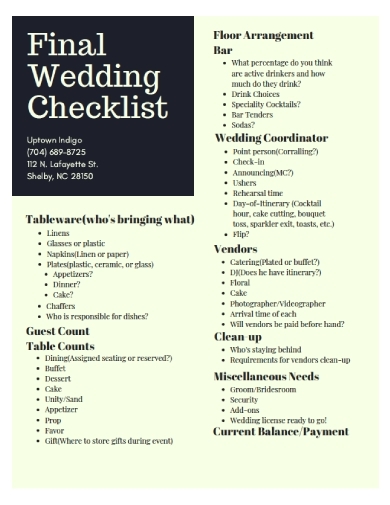 If you haven’t been involved in a wedding other than as a guest, getting started with your checklist won’t be easy. There are a lot of things that need to be covered to make sure you don’t forget anything important. Thus, using a template to write your wedding checklist would be a great idea. 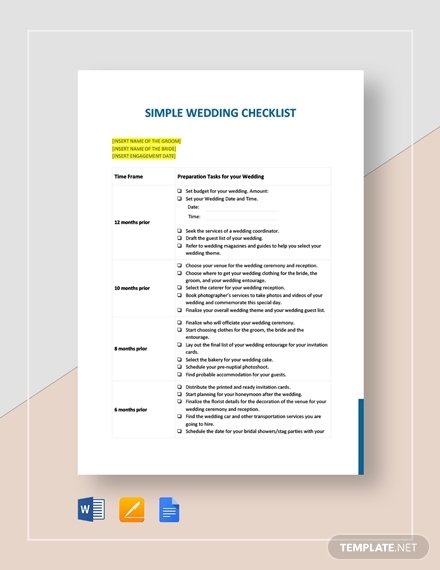 A simple wedding checklist will address the basics and the specifics of your wedding to keep you informed on what needs to be done and what has been done. Some brides can be very particular about the kind of flowers that are used for their wedding. Although florists are trained and experienced to meet the demands of their clients, a checklist is often used to make sure these requirements are fulfilled. 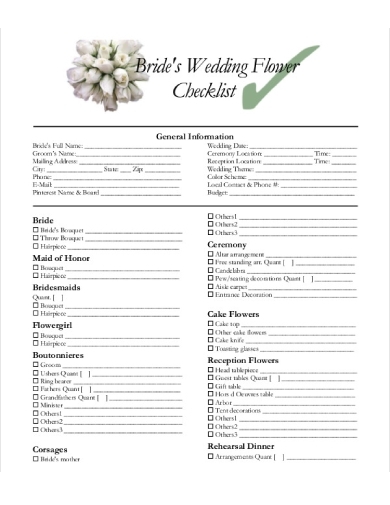 A flower checklist may comprise of details regarding the flowers arranged for the rehearsal dinner, ceremony, reception, and the couple’s entourage. Weddings are celebrated differently in various regions depending on one’s cultural and religious background. 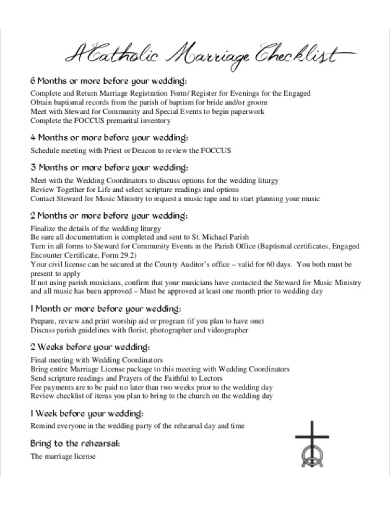 A Catholic wedding, for instance, involves a series of steps and requirements that couples must go through before they can receive the Sacrament under church policies. Apart from completing a registration form, several applications and documents should also be settled weeks before the wedding date. The whole experience can be overwhelming to a couple, so you might want to use a checklist to keep you guided. Planning a destination wedding isn’t as fabulous as some people perceive it to be. While the outcome might seem like a scene straight out of the movie, imagine the number of resources it takes to build everything from scratch. 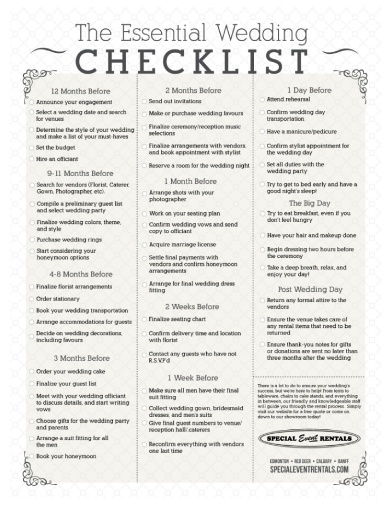 One of the best ways to plan out the details of your destination wedding is to have a checklist in hand. The list should cover every aspect of the event from the smallest to the most obvious details. This includes your wedding itinerary, flower arrangements, wedding menu, and equipment rentals. After months of preparation and only weeks before the big day, finalizing your wedding is a crucial step to prevent further obstacles from disrupting your plans. To do a quick run-through of these arrangements, a final wedding checklist is sure to come in handy. This will help highlight your priorities and point out any items that require immediate action. It’s easy to forget even the simplest parts of your wedding plans, so the least you can do is to have them noted down for reference. There isn’t enough time to prepare every single part of a wedding, even if you had a whole year to make the necessary arrangements. Thus, you might want to consider utilizing a formal wedding checklist to set reminders and updates of the progress made so far. Stressing over your wedding is completely normal, but the last thing you would want to do is to worry about the things that could have been avoided through early planning. The moment you and your partner set a date for your wedding, you need to prepare yourselves for the beginning of an exhausting journey. As if planning the ceremony and reception of your wedding isn’t stressful enough, couples who want to make a promise before God and the witnesses present generally have a long list of to-dos to attain. 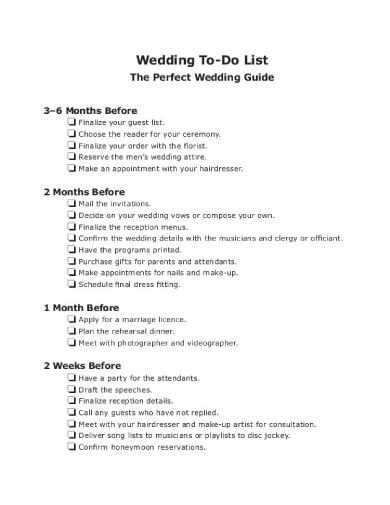 Fortunately, this is easily summarized through a wedding and marriage checklist that contains a detailed description of the tasks to be completed over the next few weeks or so. Wedding planning is only fun if time and money weren’t a factor. Imagine how difficult it would be to make wedding decisions without a definite plan to follow. 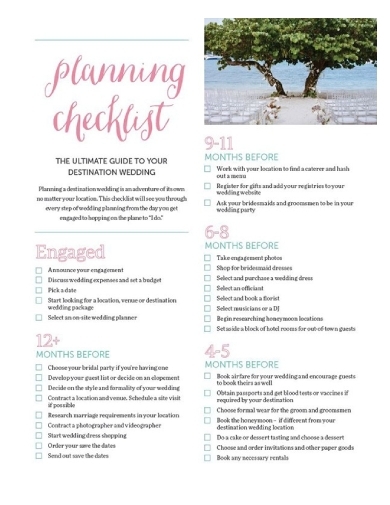 One way to help keep you focused and objective-oriented as you go through the different stages of wedding planning is to use a checklist. This is a clever technique that can be applied to help you conquer the challenges of wedding planning with great success. 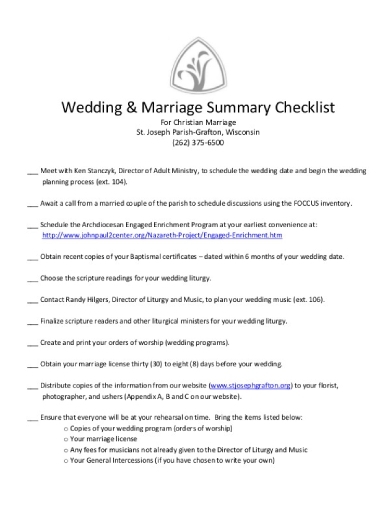 Shown above is a guide to help you prepare for your wedding in the most organized way possible. A wedding checklist covers the months leading up to your wedding day to help you prioritize your wedding essentials with ease. Think of it as a task checklist that will keep you motivated through the most difficult times. It can also be very fulfilling to see you slowly cross out each item on your checklist as you slowly approach one of the biggest milestones of your life. If you only have less than a year to finalize the details of your wedding, it’s best to use a checklist to keep yourself on your feet. 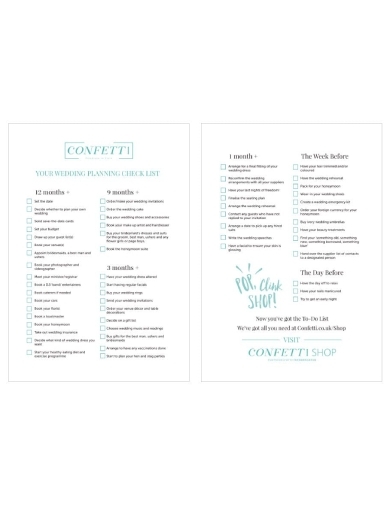 Things are going to get pretty hectic in the coming weeks, so you need a wedding checklist to remind you of the things that need to be attended to immediately. A to-do list might seem intimidating at first, but you’d be surprised by how convenient and effective it can be to help you get things done on time.